RTLS Integration Kit | Location Running. 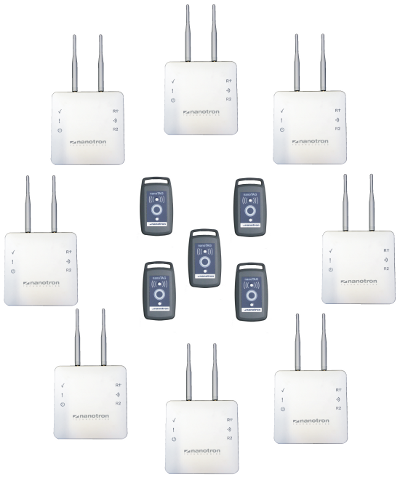 The RTLS Integration Kit consists of 8 anchors, 5 tags and the location software nanoLES. 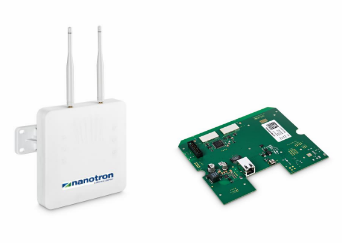 The kit demonstrates in an easy way how nanotron’s RTLS works and gives system integrators the possibility to develope their own RTLS solutions with the help of this basic tool. Hardware components of the kit are 8 nanoANQ EA’s and 5 nanoTAGs, see picture below. Alternatively, nanoANQ board can be chosen. This is even more flexible since the anchor board can be integrated in any anchor products developed by system integrators. Before deploying anchors in an RTLS system, network infrastructure like Ethernet must be installed to allow communication between anchors and the location server. The performance of an RTLS is measured in terms of system throughput and location accuracy. Throughput is the number of location readings in a given period of time. The current air interface supports more than 250 location readings every second. Nanotron’s anchors and location server have the ability to detect and process much more such that the overall system throughput may reach several thousands per second. With each location reading, additional payload such as temperature, air pressure, battery voltage, acceleration of tags can be transmitted. Accuracy is measured as distance from or area around the real location of an item (e.g. tag). Most of the location readings for a given tag can be found within a small circle around its true position. With nanotron’s RTLS platform, location accuracy of 2 m indoors and 1 m outdoors can be achieved. Generally, the performance outdoors is better than indoors due to less reflections.